Jim Sautner, who lives near Spruce Grove, Alta., keeps a bison named Bailey Jr. as a pet. 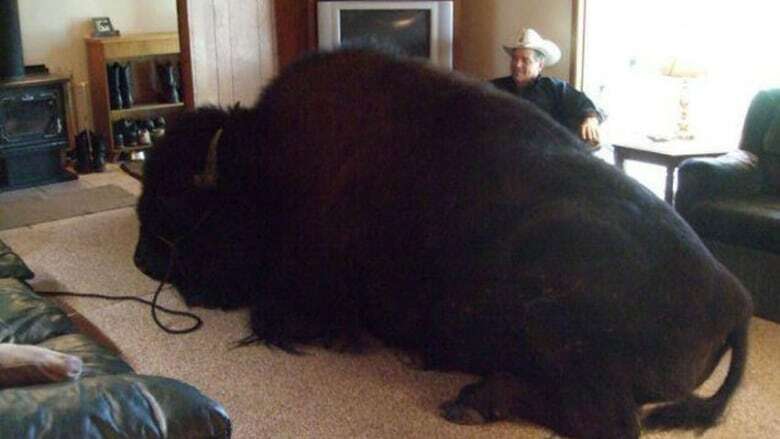 Jim Sautner of Spruce Grove, Alta., keeps a 825 kg bison as a pet. It no longer lives in the house. Sautner told Trail's End's Allison Devereaux that caring for a bison isn't much trouble. He eats hay and oats, and takes care of his own coat. "All I do is I take an air hose from the garage and blow his coat off before we go in a parade or to a function of some sort," Sautner says. Sautner says that in his old house, Bailey would come in and watch TV, drink water out of the sink and generally behave like a dog. Bailey is not permitted inside the new house. Bailey Jr. is Sautner's second bison pet. Bailey Sr. died in 2008. "He's my best friend." Sautner says. "He's my buffalo."